What is it: This is a heavy duty concentrate liquid for all fabrics. Easily disperses in wash water so fabrics come out their cleanest. Enhanced with Scent Kapture Odor Encapsulating Technology that controls odors on contact by odor encapsulation and elimination. 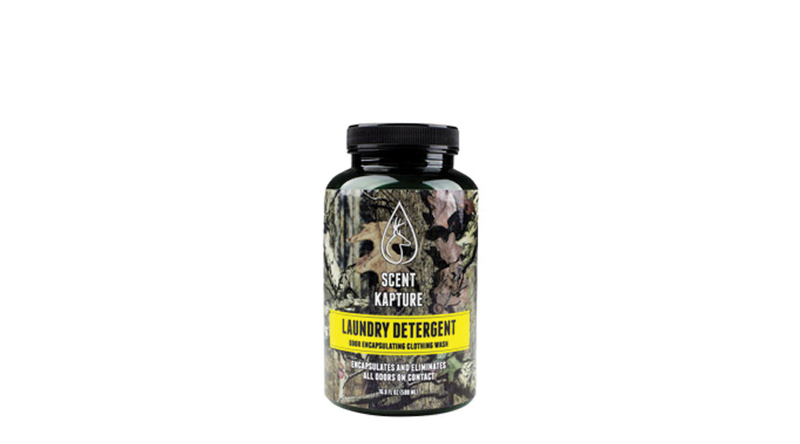 How it works: Scent Kapture Laundry Detergent uses the Scent Kapture Odor Encapsulating Technology to attach to and remove any odors that exist on your hunting clothing and gear. There are no UV enhancers so you can remain undetected by wild game. Directions: Use 1 1/2 to 2 oz of Scent Kapture Odor encapsulating Laundry Detergent depending on the size of the load to ensure scent free and UV free clothing. Store in scent proof storage following drying. Bonus Uses: Sports uniforms, farm clothing exposed to livestock odor, and many more. Scent Kapture Odor Encapsulating Technology attaches to odor molecules, encapsulates them, and eliminates them.